How many of you set New Year’s resolutions for 2016? It’s easy to feel confident in your abilities while celebrating the end of one year with the energy, optimism and promise of the new year pushing you from behind. It’s understandable to feel strong the first couple of days of January, but what happens after the first week or two? It may not be such a simple task to stay the course. A 2007 study by Richard Wiseman from the University of Bristol, involving 3,000 people, showed that 88% of those who set New Year’s resolutions fail, despite the fact that 52% of the study’s participants were confident of success at the beginning. Knowing that there is such a high failure rate, what can be done to increase your odds of being one of the successes? You have a 12% chance of victory. What do the 12% who win do differently than those who give up? 1) To begin with, it’s vitally important to write down your goals. 2) Next, you must believe in your heart and soul that you can accomplish your resolution. Failure cannot be an option. 3) It is extremely good planning to share your desire with at least one supportive and understanding person, someone who will hold you accountable and not judge. 4) Celebrate small victories along the way! Remind yourself of other habits you have changed or new skills you have learned and put into action. If you were able to accomplish those things, certainly you can master another new habit. 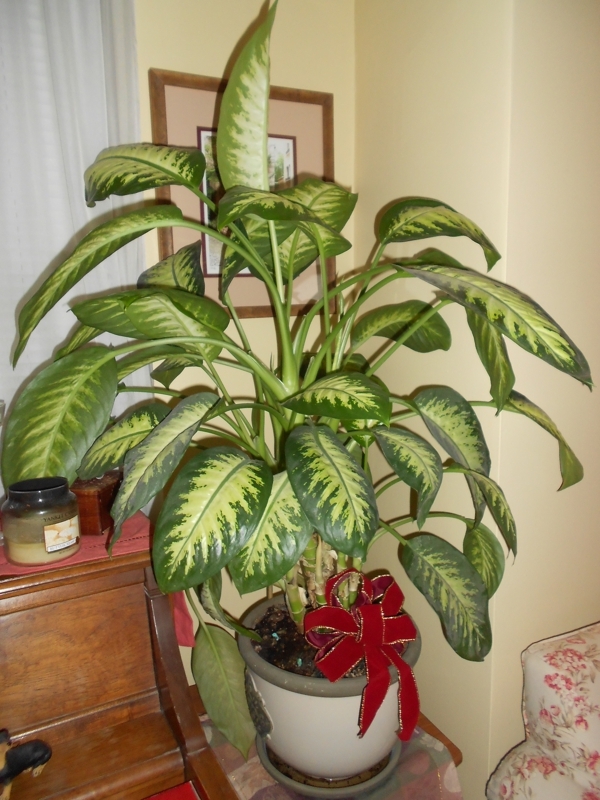 For instance, I had never had any luck keeping houseplants alive as a younger woman. Oh, I tried many times, but I cannot begin to tell you how many dried-up plants had ended up in my trash cans over the years. Most of the time, the problem was one of discipline. Plants absolutely need to be watered and fed regularly. I failed miserably in my efforts. The plant pictured here was purchased in the early Summer of 2011. It had about 4 shoots, measuring 6-8 inches in height. In the fall of ’11, I brought it inside and began the routine of care it needed. As you can see, in this picture dated 1/1/2013 – then 1 1/2 yrs. old, my plant was much bigger than 8 inches! I’m proud of this accomplishment…..very proud! I can’t begin to tell you how many houseplants over the course of my 54 years have met their untimely end. I just lost another one last month, to the cold. It’s very sad to me. But I am happy to report that the plant pictured is one of twenty that are now part of my happy little home. So, getting back to New Year’s resolutions…..if I ever begin to doubt that I am unable to master something new in 2016, all I need to do is to take a glance at this plant. If I was able to master the discipline to successfully grow this beauty, I can accomplish anything that I set my mind to. Celebrate your past successes and you will cement your future ones.